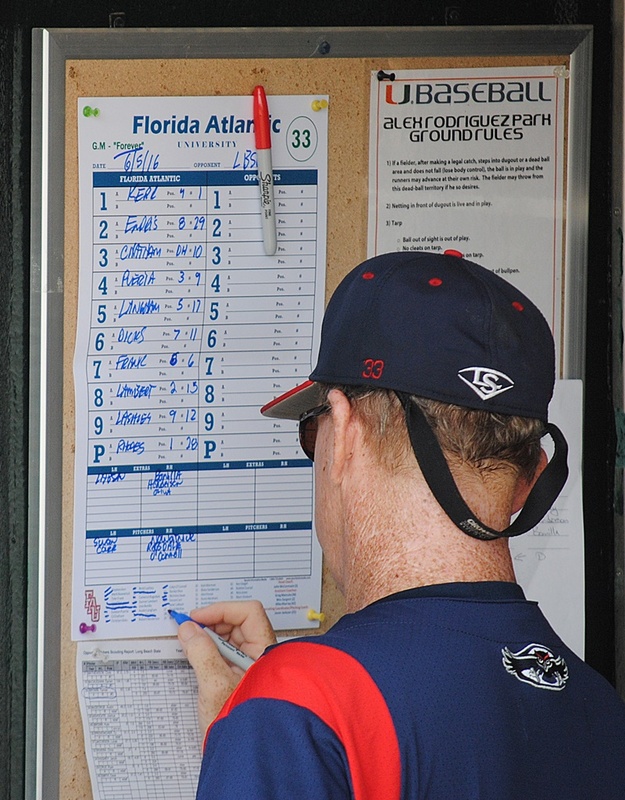 FAU coach John McCormack fills out the lineup card. 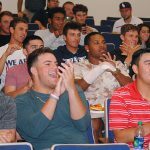 BOCA RATON – While FAU’s 9-8, 10-inning defeat of Rice on Saturday (into Sunday) in Conference USA garnered national attention, a game played the prior night actually proved to be the game of the year for the Owls. Having lost to Rice earlier in the day, No. 3 seeded FAU faced second-seeded Louisiana Tech in an elimination game between NCAA bubble teams. In a game loaded with plot twists, FAU fell behind early, took the lead with four runs in the fourth, watched La. Tech tie the game an inning later, before finally prevailing 8-6. Throughout the game McCormack faced several crucial decisions. 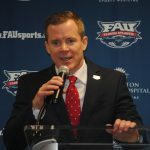 The wrong choice could potentially end FAU’s season. Throughout the potentially do-or-die game McCormack consistently made the right choice. On Monday he provided the rationale behind those choices. Situation: Creating the batting order. Decision: FAU lost No. 3 hitter David Miranda to a hamstring injury in the opening game of the C-USA tournament. For the second game, a loss to Rice, McCormack elected to move Tyler Frank – then the Owls’ No. 2 hitter – to the lead-off spot, letting Cody Wilson hit third. Result: Frank grounded out in his first at-bat, but homered in the fourth inning and again in the sixth, driving in a total of five runs. Wilson recorded two hits, scored twice and drove in a run. Situation: La. Tech had already scored three runs and had two more runners in scoring position with two out in the inning. Decision: Lighting delays earlier in the tournament forced FAU to burn more pitchers than it desired, and pitching is at a premium in tournament play, but McCormack decided he’d seen enough from starter Vince Coletti. He brought Nick Swan out of the bullpen. Result: Swan struck out the first batter he faced to end the threat. He’d allow one run over the next two innings, quieting the Bulldogs’ momentum and giving FAU’s bats a chance to keep up. Situation: Leading 7-5, FAU needed three outs to get the game to closer Zach Schneider for the final two innings. Decision: In an unconventional move McCormack turned to lefty Weston Clemente. The senior captain hadn’t pitched well all season, entering the tournament with an 8.10 ERA. On top of that, Clemente had already pitched 1 1/3 scoreless innings earlier in the day against Rice. Result: Weston walked the first batter he faced, then found his rhythm, inducing three fly-ball outs in a scoreless inning. Situation: Still leading 7-5, FAU put runners on first and third with two out when a lightning delay struck. Decision: When the game resumed McCormack called for one of his favorite trick plays. On the first pitch Eric Rivera was to break for second, then get in a rundown that would hopefully last long enough for Cody Wilson to score from third. Result: Rivera drew the throw to second, allowing Wilson to sprint home uncontested with the Owls’ eighth and final run of the game. Rivera actually stayed in the rundown far longer than necessary, and nearly completed the steal of second. The scoring on the putout: 2-4-3-6-3-1-6. Decision: The two previous weather delays FAU experienced in the tournament prompted McCormack to change pitchers. This time, however, he stuck with Schneider, sending him out for a second inning of work more than an hour after he completed his previous inning. Result: The ninth inning didn’t start well for FAU. Schneider walked the lead-off hitter, then hit the next batter, bringing the tying run to the plate. Situation: With no outs and the tying run at the plate, McCormack emerged from the dugout and briskly walked to the mound. Decision: Rather than bring in another pitcher, McCormack elected to stick with Schneider. Result: Schneider induced a soft looper to center which fell at the feet of Cody Wilson, who quickly fired a strike to second for a force out. After an RBI single cut the Owls’ lead to two runs, Schneider induced a ground out to third that erased the lead runner; then a ground ball to second to end the game – giving Schneider his C-USA leading 15th save of the season. The win likely sealed FAU’s at-large bid in the NCAA tournament. Louisiana Tech will be watching the tournament on television. No. 3 FAU faces No. 2 Jacksonville on Friday in the Gainesville regional. First pitch is scheduled for 6:30 p.m.